The ability to link human brains to machines, create new life forms and build Star Trek-style disease detectors will be the focus of a new Defense Department office soon. The new office, named the Biological Technology Office, or BTO, will serve as a clearinghouse for Defense Advanced Research Projects Agency, or DARPA, programs into brain research, synthetic biology and epidemiology. The office will cover everything from brewing up tomorrow’s bioweapon detectors and connecting humans to computers to designing entirely new types of super-strong living materials that could form the basis of future devices. Here are the key areas in more detail. The human brain is often called the most complex object in the known universe, composed of 100 billion neurons and 100 trillion synapse connections. As a computer, it performs 10,000 trillion operations per second. That’s about one third as fast as the Chinese Tianhe-2 Super computer, which can perform 33,860 trillion calculations per second. But the human brain does it’s calculating with just 20 watts of power. Tianhe-2 needs 24 million watts. In the last two decades, our understanding of the human brain has advanced tremendously through functional magnetic resonance imaging, or fMRI, magnetoenceplograhy, and high-resolution brain scans. Our ability to use brain signaling to control devices has grown at a similar pace, but getting brain material to mesh with sensors and electronics is no simple matter. A DARPA program, Revolutionizing Prosthetics, to better help veterans with amputated limbs control prosthetic legs and arms with brain signals was announced in 2009 but only very recently began to bear fruit. Last year, researchers from the Rehabilitation Institute of Chicago demonstrated a cybernetic arm prosthetic that functions like something straight out of RoboCop. The BTO will oversee a variety of programs aimed at understanding both the hardware and the software of the human brain. 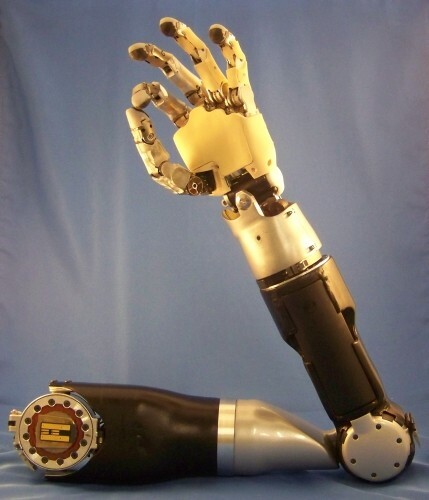 “The prosthetics that are wirelessly neurally-controlled are just at the research stage. But some of the ones where the prosthetics are connecting in to the peripheral nervous system or are being controlled by other muscles in the body are currently in an FDA process,” said Arati Prabhakar, DARPA director, in an interview with Defense One. So while we still haven’t been able to connect a prosthetic directly to the brain, researchers have achieved much better integration with prosthetics and nerves. The agency’s Cortical Processor program, with a $2.3 million FY 2015 budget request, seeks to recreate in software the brain’s capability to take in lots of incoming stimuli from sensory organs and spit out recognized patterns. “There is a processing structure in nature, the mammalian neocortex, that… routinely solves the most difficult recognition problems in real-time…” according to the agency’s recently submitted budget proposal. One far off potential application for the agency’s brain research is neural-controlled piloting of drones or better steering for manned aircraft via neurological feedback, which could build off of current research using electroencephalography, or EEG, to pilot robots. EEG is a nonsurgical method for recording the brain’s electromagnetic signals via a cap that’s worn over the skull. Those signals are powerful enough to steer some robots. In 2010, Northeastern University Electrical engineering professor Deniz Erdogmus and several researchers successfully demonstrated the piloting of a Roomba robot vacuum cleaner using thoughts. In 2012, Chinese researchers at Zhejiang University used EEG to pilot a small consumer UAV. These are the sorts of incremental research breakthroughs that seem to suggest that brain-controlled quad-copters are literally hovering around the corner. But EEG signals are too crude to do brain-based piloting in real time combat operations. Useful gains in this area will require getting not just powerful but more precise signals, and that means getting hot electronics closer to the brain. Unfortunately, soft and delicate brain tissue does not easily mix with circuits. It’s a technical and materials challenge of enormous complexity, but hardly outside of the realm of possibility. A group of researchers from Singapore recently unveiled a neural probe that can be integrated on the brain with little damage to cellular structures. Bioengineered materials derived from living components like lipids and proteins would be several times more diverse and functional than designs based on more traditional approaches to chemistry. Learning to harness the building blocks of life could allow for living materials that are stronger, more flexible, more durable and cheaper than anything available today. Those new materials could make their way into battlefield armor or even electronic components. Synthetic biology also holds the promise of one day creating entirely new life forms. A group of researchers from the U.S. and U.K. recently announced the creation of the first artificial chromosome, derived from piecing together 273,871 separate DNA nucleotides from yeast, thus achieving a key step in the potential development of designer chromosomes or even new life. On Star Trek, the USS Enterprise’s doctor, Bones, carries around a handheld device called a “tricorder” that can instantly diagnose any disease. DARPA wants it. Rapidly spreading diseases, whether as a result of biological attack or a naturally-occurring epidemic, present a grave and rising national security threat. As previously discussed, a highly-lethal flu pandemic could result in as many as 150 million deaths. DARPA is looking to create new diagnostic gadgets and software to give soldiers and decision-makers “a rapid and specific diagnosis of infection so we can actually understand the spread of disease, something we don’t have visibility into right now.” The ability to diagnose infections on site, perhaps with a single, handheld device, and then report the results immediately and globally could allow researchers to quickly identify the unique genetic makeup of emerging illnesses. That could help them to “create vaccines that offer immediate protection rather than vaccines that have a few week waiting period before immunity establishes itself. If we can get those capabilities built we can move faster than the disease is spreading,” said Prabhakar. The DARPA program is called Autonomous Diagnostics to Enable Prevention and Therapeutics, or ADEPT, and is one example of the effort to conquer biological threats. The agency isn’t alone in moving to build more rapid and deployable diagnostic capabilities. Qualcomm and the X Prize Foundation are sponsoring a $10 million dollar competition to build a handheld diagnostic device. We don’t have to wait for Bones to show before realizing the benefits of the research effort. Today, health workers in Saudi Arabia are already using findings from DARPA’s epidemiology-funded research to stay ahead of the Middle East respiratory syndrome coronavirus or MERS-CoV.